Jayishni Maharaj is a post-doctoral research fellow in the School of Human Movements and Nutrition Sciences and Centre of Children’s Research. Jayishni’s research is at the intersection of biomechanics, rehabilitative and computer sciences, focusing on exploring the relationship between structure, function and injury in the foot. 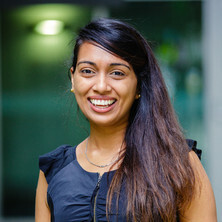 In her current capacity as a post-doctoral research fellow in the Neuromechanics lab Jayishni integrates biplanar X-ray radiography, modelling and simulation techniques to validate musculoskeletal foot models. At the Children’s Research Centre, Jayishni explores the effects of Botox on the structure and development of muscles in kids with Cerebral Palsy. Is pain associated with mechanical joint load in the foot during walking in rheumatoid athritis? A preliminary study.